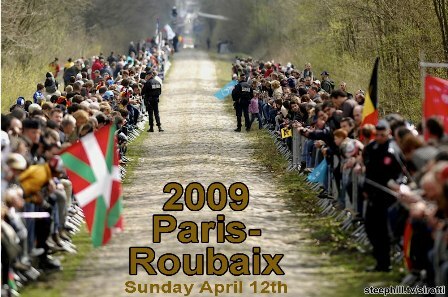 Updated 4/12/2009: Fun article appearing in Sunday’s New York Times about the Paris Roubaix and other cycling stories. I am never really clear why some cyclists continue to contemplate…bikes or golf (we just had this conversation at tazza doro too)! Is it that we fear when we can no longer ride golf is it? I suppose when I can no longer ride, I’ll probably not be able to do much else either! Lots of espresso, cafe au lait, croissants and wine flowing on Sunday, April 12th. It’s my favorite bike race of all time, the cobblestones of France…Paris Roubaix, one of the oldest bike races in history(1896) – rain, wind, spring in France and the brutality of the cobblestones on bikes and riders! One of these days I will be blogging from this race and drinking the coffees, espresso and wines from France! We’ll be watching at Tazza D’Oro come and join us. Vive Le Hell of the North! Good friends are awaiting the race at cobble section 4 (or was it 14?) just after the Arenberg Forest this year ... tres jealouse ... Just remember, direct flights to Paris start this summer!! !